Commercial deep-sea mining for manganese nodules will affect the deep-sea benthos primarily within the track of the mined areas in a harmful and long-term way. The removal of manganese nodules will not only destroy the hardbottom fauna. Also the sediment clouds, created during nodule sampling by the collector vehicle, will impact the surrounding areas. In 1989 a long-term, large-scale, disturbance and re­colonization experiment abbreviated as DISCOL was started in the tropical southeastern Pacific Ocean to mimic the impact of commercial mining and to achieve a better understanding of the rate, sequence, and direction of benthic community re-establishment after severe anthropogenic disturbance. Close to a German manganese nodule claim, a circular area of 10.8 km2 was selected as the DISCOL Experimental Area, abbreviated as DEA. Its central position is located approximately 650 km southeast of the Galapagos Islands. The water depth is between 4140 and 4160m. In 1989 an intensive sampling program was established to obtain baseline information on bacterial, meiofaunal, macrofaunal, and megafaunal communities in the DEA. 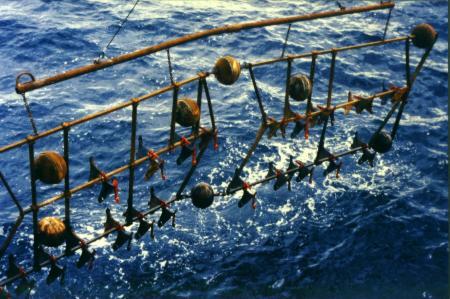 With a specially developed plough-harrow device, the DEA was impacted to study the reaction of the deep-sea fauna to a disturbance to some extend similar to a commercial deep-sea mining. The "plow-harrow" was used to created a disturbance on the sea floor. The disturber was towed across the DEA center 78 times on diametric courses, so that the central parts of the DEA were more heavily disturbed than the peripheral ones. The disturbance and the re-colonization process of the DEA by benthic animals were studied during three additional cruises made by the German R.V. SONNE (table 1). The results of the DISCOL experiment were published in various publications. The best and most realistic opportunity to study the effects of ocean mining upon the abyssal environment will be the monitoring of pilot mining operations planned by industry prior to commercial mining. Environmental studies must accompany these operations. Large-scale experiments like DISCOL, and Benthic Impact Experiments (BIEs) deployed in the Pacific and the Indian Ocean, studying the effect of a sediment plume on the benthic community, will enhance our knowledge about the mechanism of life in the largest and least understood of the marine environments and will help us to minimize anthropogenic impact on the deep-sea ecosystem.